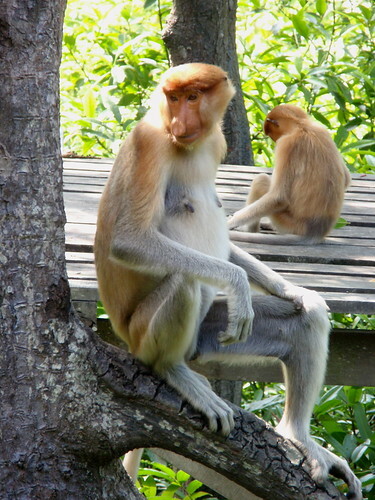 Most people visit Sabah in north-west Borneo to see its unique and increasingly endangered wildlife. We were no exception. We wanted to see the orangutans that we knew could be visited at the Sepilok Orangutan Rehabilitation Centre just outside Sandakan (where we spent time at the war memorial). But we hadn't realised there is an organised and quite expensive travel industry built around viewing Borneo's wild-life. 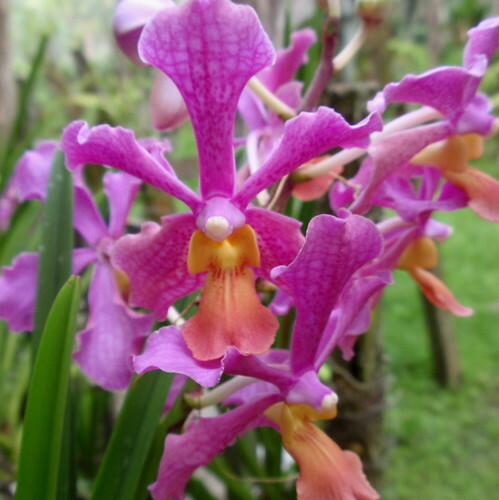 Some of the areas where you may be able to glimpse the rarer animals such as the Sumatran rhinoceros or wild elephants are only accessible through quite exclusive guided tours. And from the size and complexity of the cameras we saw, I suspect some people plan their holidays around opportunities to use their equipment to photograph the wildlife. We felt quite amateurish. 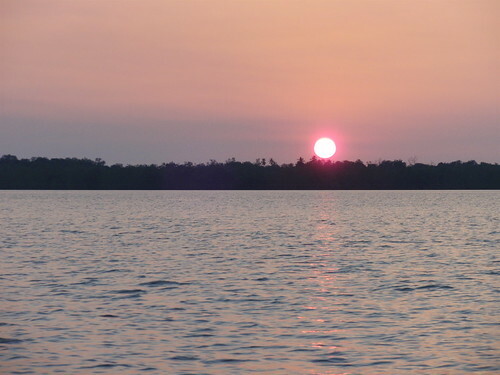 But even with our limited time and money, we did have some wonderful experiences. 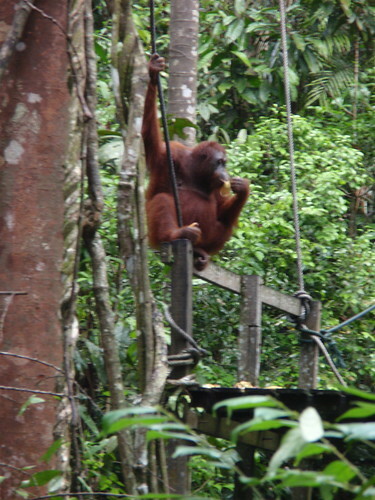 We stayed for a couple of days in a resort on the edge of the orangutan rehabilitation centre and were twice able to see the orangutans at feeding time in the afternoon. The rehabilitation centre takes young orphaned orangutans or those that have been captured by planters because the orangutans eat the palm-oil trees. And it takes orangutans that have been kept as pets and become dependent on humans. 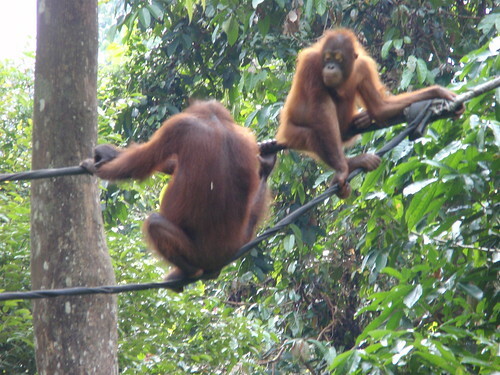 The orangutans are gradually taught to lead independent lives. At a transition stage they are released to the forest but are fed every day (which is when you can view them) but eventually they are re-released in wilder areas. A few of them never manage the full transition and remain in the feeding area. Orangutans breed very slowly - each female may have only two to three babies across her life span - so the role of the rehabilitation centres is important as the orangutan's habitat is decreased through plantation clearing. 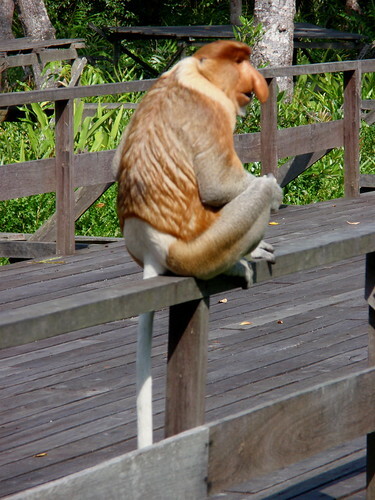 We also saw more of the proboscis monkeys we'd seen in the wild in Bako National Park. Much of Sabah - indeed, huge swathes of Malaysia - has been cleared and planted with palm-oil trees to supply the world's increasing needs for oils in food and many other products. 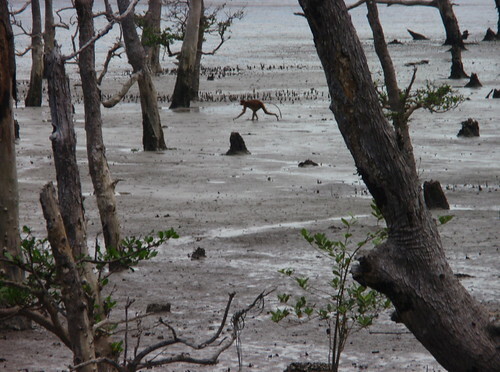 The area around Labuk Bay is one such plantation, where the narrow fringe of mangroves that was the proboscis monkeys' habitat was increasingly threatened. The plantation owner fortunately recognised this was happening and left a buffer of forest for the monkeys, as well as introducing a supplemental feeding program for them. 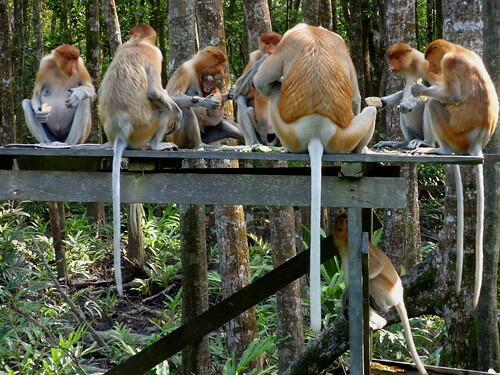 I'm not sure if the feeding is a good thing for the monkeys in the long run, but it did provide us with a great opportunity to see the bizarre long-nosed (male) monkeys up close,and whole families of proboscis monkeys noisily enjoying themselves. So, we've had a glimpse of the world of nature tourism and, as usual, my response is a bit ambivalent. 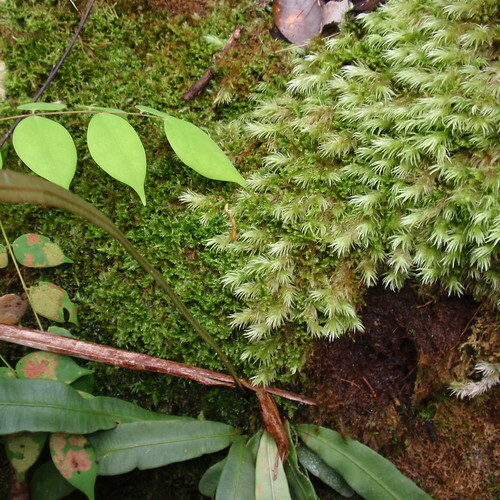 With the rate of clearing for plantation farming the habitats of many of the Borneo species are being invaded. Were it not for the rehabilitation centres and sanctuaries such species as the orangutans and proboscis monkeys would be more endangered than they are. They're not in enclosures and the aim of the orangutan rehabilitation centres is to enable them to be self-sufficient. Both the orangutans and monkeys are breeding well which I imagines indicates that the situation suits them. But they are, to varying extents, dependent on feeding by humans and they come to trust people and are comfortable around them, which must be dangerous in some contexts. But even with these doubts, I'm very happy to have had these experiences. 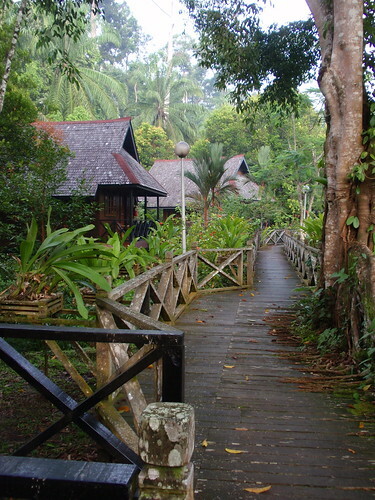 We stayed a couple of nights in the very beautiful (though not very luxurious) Sepilok Nature Resort so that we had easy access to the orangutan sanctuary. 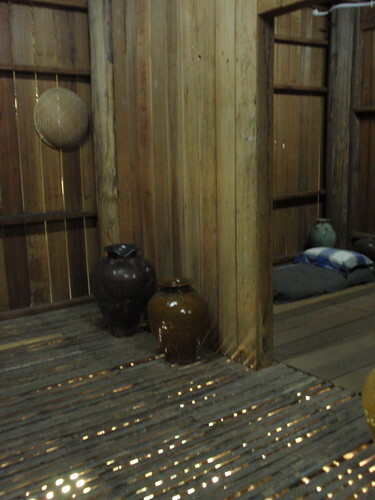 The resort is a series of huts made from local wood, clustered around a small lake. One morning as I went on a walk around the grounds there was a very active, cheeky family of macaques at the end of the walkway in the photo above. The gardens of the resort are especially wonderful as they've been planted with lots of flowering plants and luxurious trees. 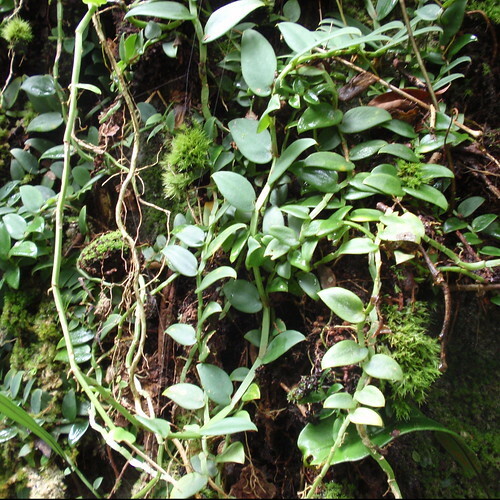 All the plants you see often languishing indoors in Australia, are here in their natural habitat and are bigger, brighter and infinitely more healthy. 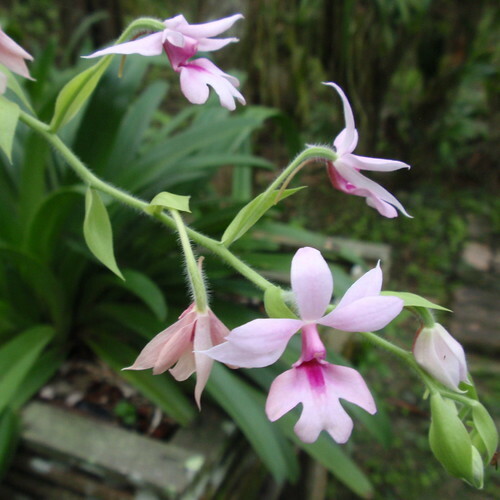 There are orchids scattered throughout the garden and even though it's not really the orchid season there were enough blooms to keep me happily admiring. My friend Jan and I like to visit museums when we travel. Maybe that's an understatement. We're very easily diverted and if we aren't strict with ourselves we can linger much longer than we intended. 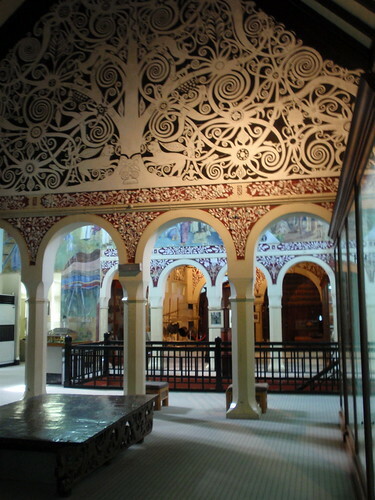 Kuching is full of museums. We happily missed the wood museum and the cat museum, but we did go to the internationally renowned Sarawak Museum which has existed since 1891 and has had a number of respected curators. I love the story of the design of this building. It's a copy of a Normandy Town Hall, designed by the valet of the second 'white rajah', Charles Brooke. It's a very old-fashioned museum whose ground floor is full of beautifully constructed cases with rocks, minerals, shells, and rather scruffy aged samples of the amazing animals and birds to be found in Sarawak. 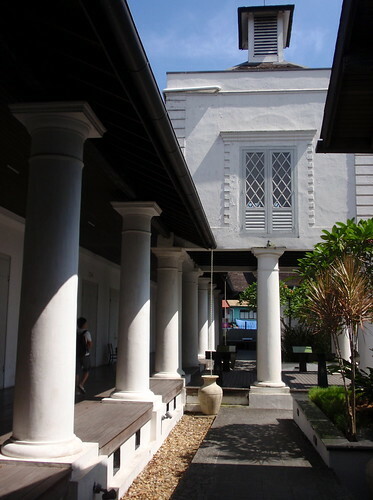 Upstairs, in a rather elegant space, is the collection of ethnographically rich material culture from the peoples of Sarawak that the museum is most noted for. It's the kind of museum that tempts anybody who has ever had the slightest temptation to collect anything...'wouldn't it be wonderful to have a set of old Chinese dishes? ', 'I wonder if I could buy baskets like those...' But ultimately, I found it somewhat unsatisfying. However beautiful or unusual or representative the exhibits are, I want to know more of their context. I want to know how they were used and by whom, and whether the decorative quality of the object has a meaning. 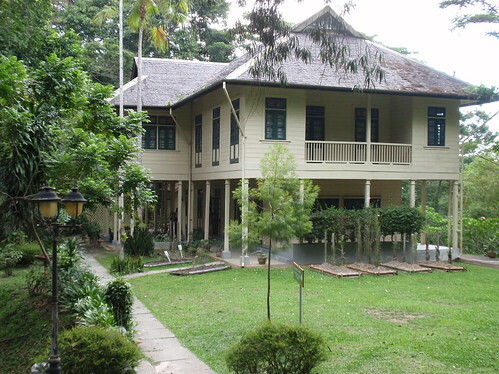 Nowadays, the Sarawak Museum is a rather lovely historical example of an ethnographic museum. 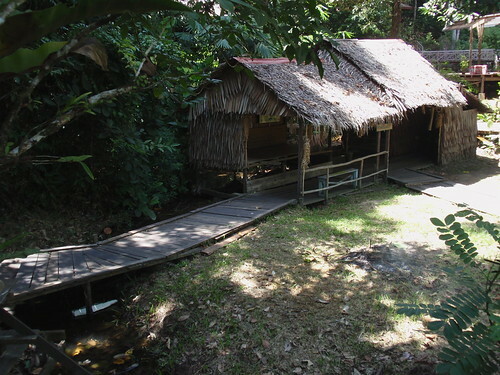 Maybe others had also felt the need for context for in 1990 the Sarawak Development Corporation constructed the Sarawak Cultural Village outside Kuching in a superb natural forest. I think most of us are very wary of the cliched 'recreations' of ways of life, but I think this one works surprisingly well. 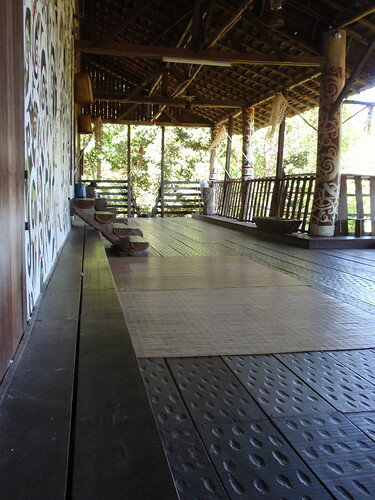 There are traditional buildings - including longhouses - built by and for each tribal group, and handicrafts such as weaving or carving are practised by people living or staying for some time in the houses. The Cultural Village clearly has a political purpose. It was filled with people the day we visited. 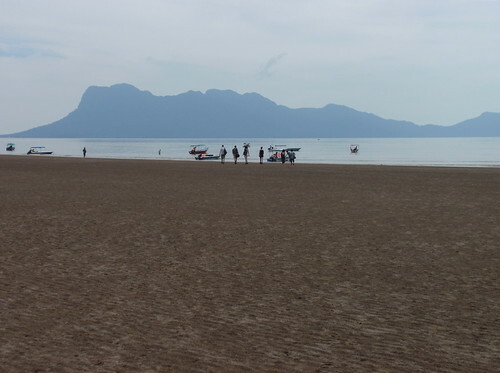 There were a few Western tourists, but most of the visitors were local people - some from the area, some of them internal tourists from peninsular Malaysia, and groups of high school and college students. 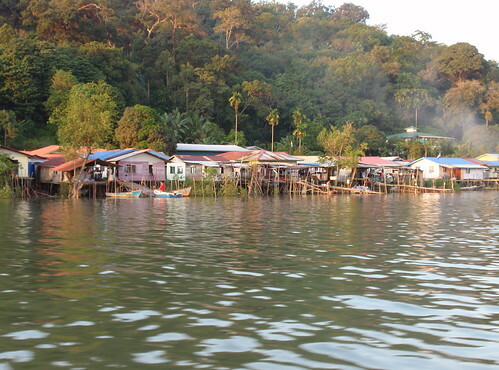 The Village provides some public validation for the tribal groups in Sarawak and their customs and way of life, within a community where they are otherwise the most disadvantaged. There is also a public presentation of Malaysia as unified within its diversity - which is an aspiration for how the society could work but sometimes falls short. We enjoyed our visit to the Sarawak Cultural Village and the opportunity it gave us to see something of the architecture and artifacts of the traditional peoples of the Sarawak area. We also loved seeing the responses of others to these displays. But I guess the uncomfortable thing is that this is after all a display, and to find the right line between objectifying the groups of people whose cultures are displayed and accepting those customs as a natural part of the wider culture is very delicate and difficult. 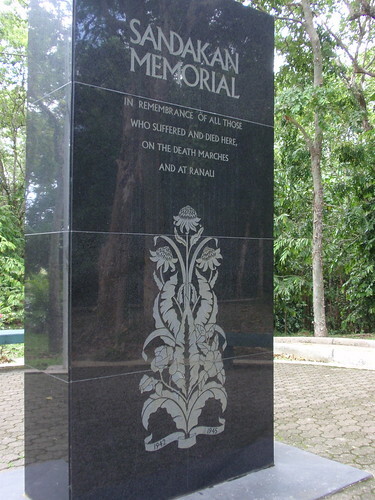 There were no such dilemmas when we visited the Australian War Memorial at Sandakan in Sabah in North Borneo. This is a park with a simple pavilion with well-designed, simple, text, photos and illustrations telling the story of the Sandakan POW camp and the death marches to Ranau during the second world war. The exhibition in the pavilion has been put together by the Australian War Memorial and is impressive in its simplicity and understatement. It's a story that doesn't need exaggeration or embellishment because it is so shocking. In 1942 and 1943 the Japanese brought about 2,700 prisoners of war to the Sandakan camp to work as labourers to build an airfield. The climate, disease, infection, starvation and harsh treatment took their toll. Towards the end of the war the Japanese retreated from Sandakan and forced the POW's to act as carriers for the trek through the jungle. By the end of the war, all except six of the 2,700 POWs were dead. These six Australians had escaped during the march or after reaching Ranau and it is their stories that reveal the full horror or the Sandakan camp and the marches. The memorial works because it's simple, and tells much of its story in the six survivors' own words and because, as well as remembering the POWs, it acknowledges the assistance given by the local people and their suffering and resistance during the Japanese occupation. 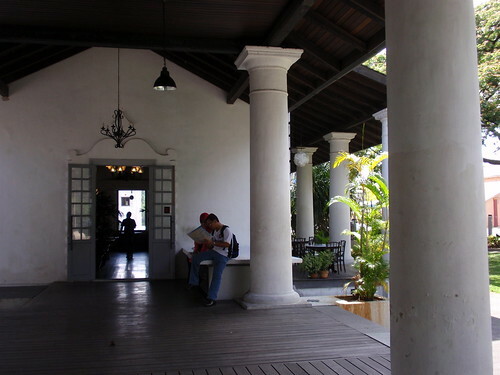 Another simple, but much quirkier museum we've visited in Sandakan is Agnes Keith's House. Agnes Keith was a writer who lived in Sandakan with her English husband from 1934 to 1952 - initially living the life of an expatriate wife in a rather backwater colonial outpost. She wrote about these experiences but became much better known after the publication of her book 'Three Came Home', based on her own and her family's experiences when interned for three years by the Japanese during the second world war. The Keith's wooden house was built on a hill overlooking the town, but was destroyed during the war. 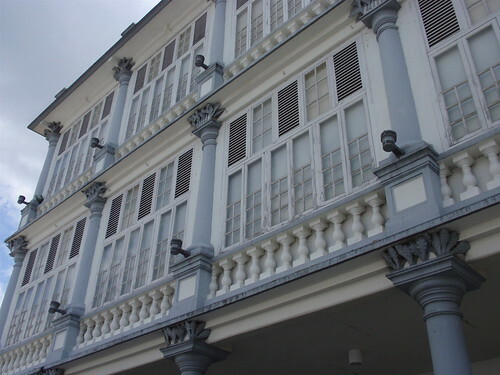 A replica of the original house was rebuilt by the government after the war and Henry Keith and his wife came back to Sandakan. 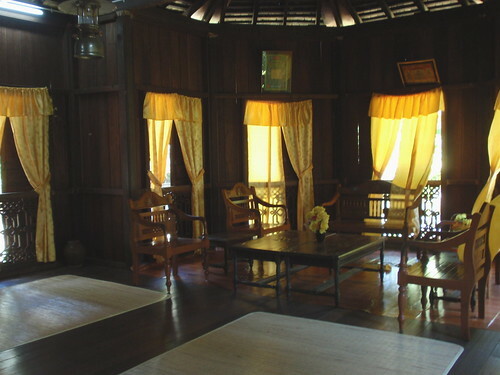 The house is decorated with furniture of the 30s and 40s and with photos of the Keiths and their work and social lives. I'm not sure why this museum works so well. I guess it's because it evokes a way of life that no longer exists and that seems almost inconceivable when contrasted with today's Sandakan. It very successfully creates the context of Agnes and Harry Keith's lives. I'm sure there'll be more museums before our trip is finished. 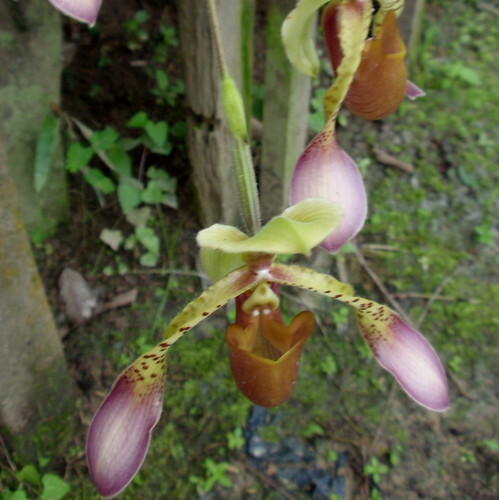 Many of the people who visit Sarawak do so because of its rich biodiversity. 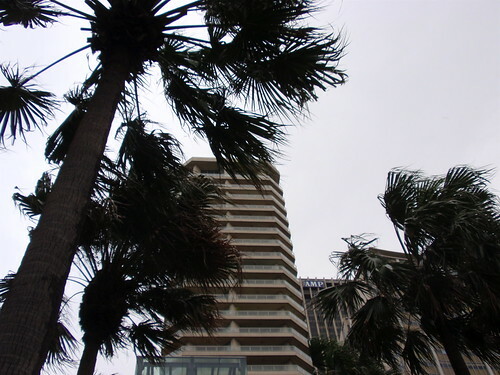 Its heat and humidity make it an ideal environment for lush tropical growth. 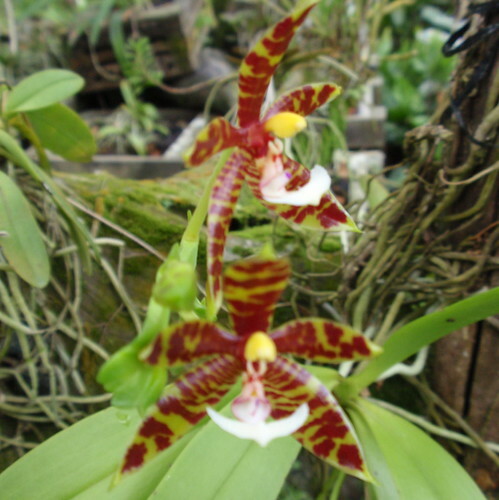 Much of the island was originally covered with dense forests and and despite the depredations over the last century or so of loggers, drillers and miners, a significant part of Borneo is still wild jungle inhabited by species of wildlife found nowhere else in the world. 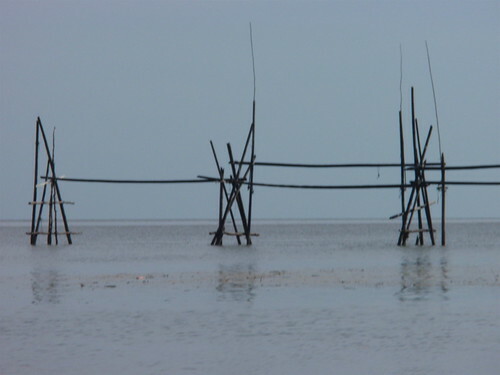 and then along the coastline of the South China Sea. 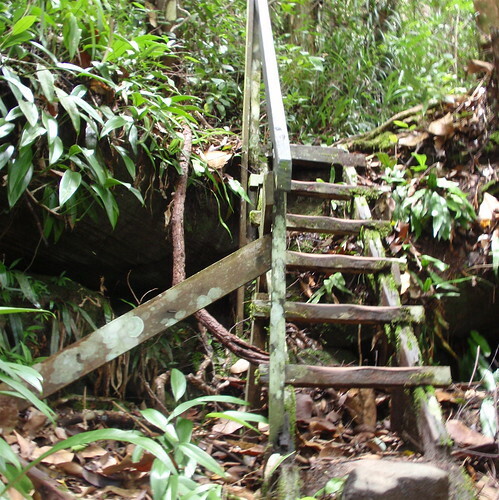 At Bako, our tour included a walk along a jungle trail, across and around rocks, up and down small ladders, and criss-crossing tree roots. I was very hot and bothered and left the group about half-way through the walk to return along the track at my own pace. 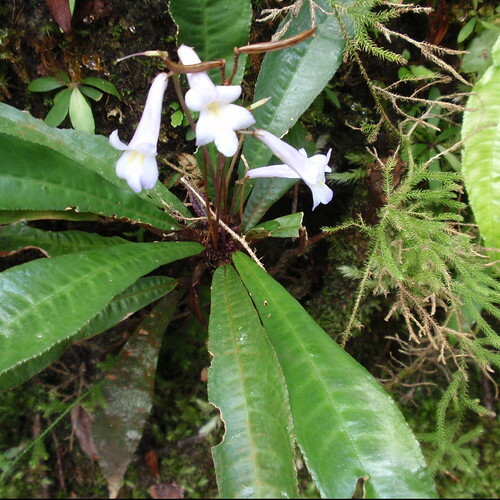 I was so pleased with my decision because as well as enabling me to potter along slowly, I was able to stop from time to time and really see the detail of the layers of plants that form the luxuriant vegetation. 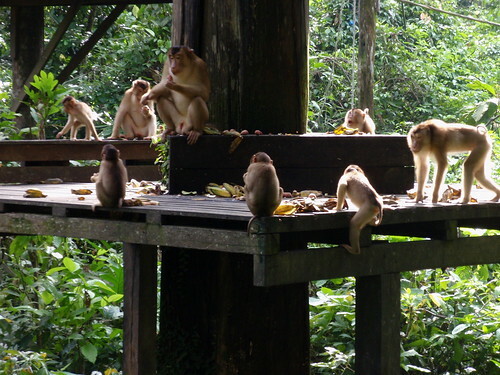 And even better, once I'd arrived at the end of the trail and was sitting quietly in one of the resting places near the mangrove flats that edge the sea, a whole family of eight proboscis monkeys ran across the mud in front of me. Seeing the rare proboscis monkeys is one of the main reasons for visiting Bako, so I felt very lucky to have seen the family procession across the mud. We later saw several of them up close in surrounding trees. They are apparently unable to digest sugar in any form and the leaves of the mangroves form the major part of their diet. 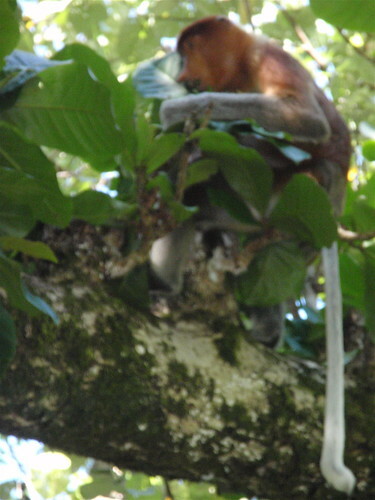 We had an extremely fortunate visit as not only did we see the proboscis monkeys in the wild but also saw silver leaf monkeys, a long-tailed macaque, wild pigs, green vipers, a flying lemur and the local squirrels. Having grown up short-sighted, I'm normally not very confident of my ability to see quickly-moving animals in the wild, so I was very pleased by all the day's sightings. 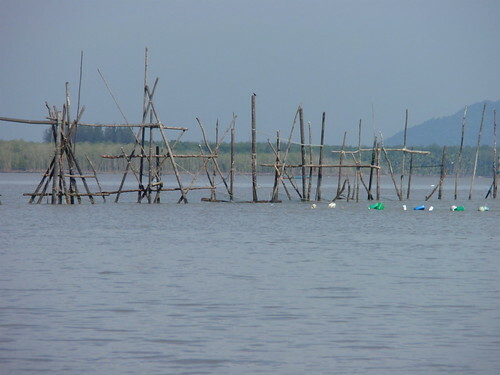 We also took a boat trip at dusk along the Santubong River to where it emerges to the South China Sea. In the afternoon light both the heights of the nearby mountain, Gunung Santubong, and the fishing village on the Salak River were magical. ...and then we did see the dolphins - three of four of them - emerging and submerging and huffing. Their huffing breaths as they broke from the water were moments of great delight. It made them seem very immediate. So, for someone who doesn't often venture into the natural world, I've had some very pleasurable times in the last couple of days. My guidebook quotes Charles Darwin's description of Sarawak as 'one great wild, untidy, luxuriant hothouse, made by nature for herself'. I count myself very fortunate to have been able to visit this particular hothouse. 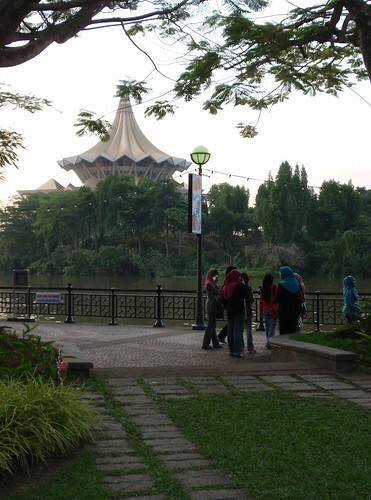 We're in Kuching, the capital of the state of Sarawak, on the island of Borneo, in Malaysia. This is a great place to start a holiday. Even though it's a city, the pace is relaxed and many of the things we want to do are within walking distance of our hotel and close to one another. 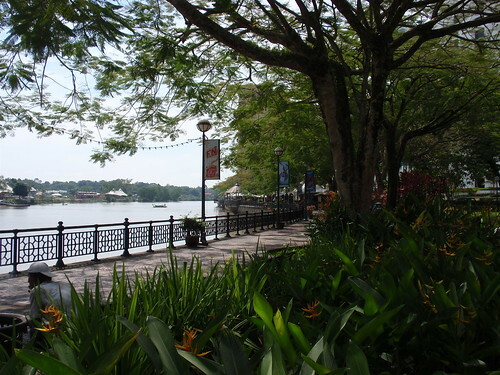 Kuching spans the Sarawak River, and there's a wonderful riverfront walk with luxuriant tropical gardens along one side of the river. This means we can stroll into the old city centre along the Main Bazaar without having to deal with traffic and the usual busyness of a city. Kuching's not an old city. 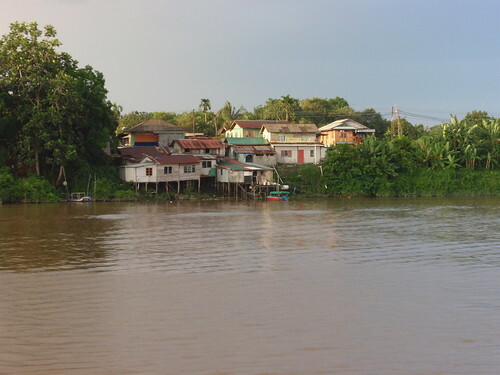 Well into the nineteenth century Sarawak was inhabited by people of different language and cultural groups - some, such as the Penan were hunter-gatherers; others such as the Dayaks lived in extended families in longhouses and were renowned for the ferocity of their warriors. 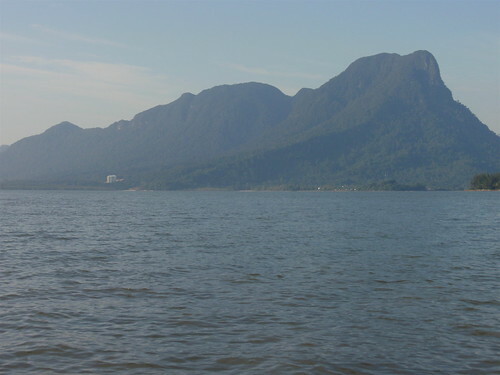 The British explorer James Brooke sailed into the Sarawak River in 1839 and by 1841 had become the first 'white rajah' of the area. He encouraged Chinese immigration to provide trade and labour for the community. 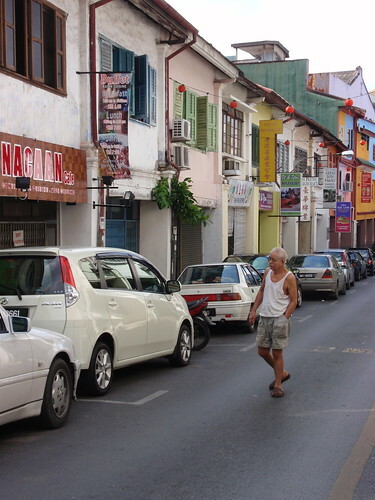 Even today Kuching is a culturally diverse city with Malays, Chinese and indigneous peoples in roughly equal proportions. The buildings are still partly used as a court, but also now house the Sarawak Tourism Board - probably the most beautiful tourist information office I've ever been in. 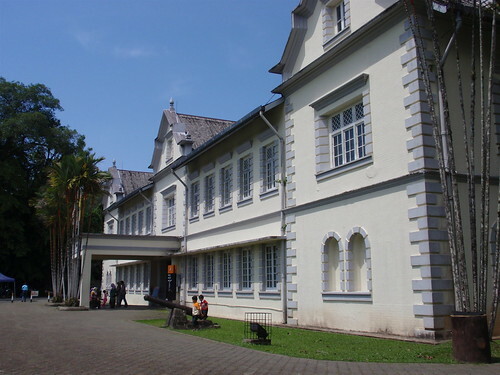 Next door is the ornate Pavilion building whose chequered history includes use as a hospital when it was built in the early 1900s and then later as an information and propaganda centre during the Japanese occupation during the second work war. 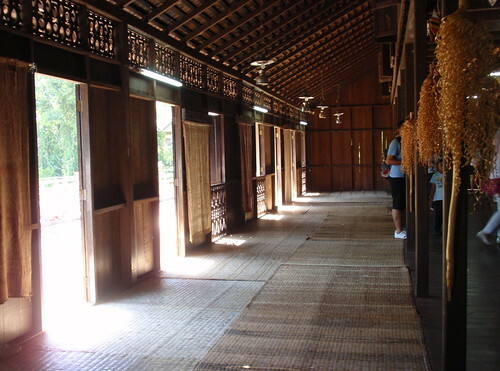 It's recently been converted to a lovely textile museum with examples of the rich, wonderful, old and more recent textiles from the groups of people who inhabit Sarawak. There are the intricately patterned warp-dyed cloths of the local Iban people with their deeply significant designs, richly gold-embroidered silk Malay songkits, and batiks overlaid with floral designs from Chinese nonya costumes. Beautiful examples of the textiles were supplemented with old and more recent photographs of people wearing costums made from the fabrics. Sadly, we weren't able to take photos inside the museum, so I'm trying to remember and recreate them in my mind. and temples around every corner in the old, Chinese part of town. 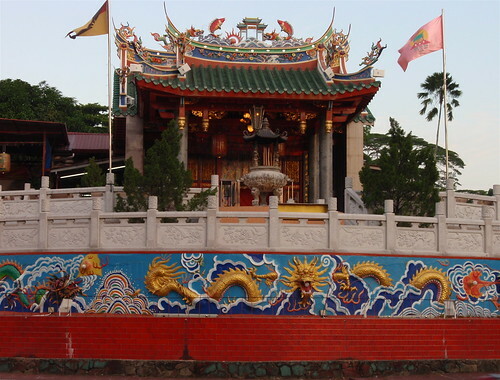 Just today I learned that Kuching has two city halls and two mayors - one, Malay, to the north of the river and the other, Chinese, to the south. I'm having difficulty deciding how to think about this. Such categorisations might seem to be a recipe for division and wastefulness, but in its day-to-day life Kuching provides an image to the observer of people living peaceably, but differently, together. The state of Sarawak recently built a new State Assembly building that is highly visible from the riverside walk. It's extremely grand - though I'm not sure how to describe its ornate architecture - part Islamic, part gothic, part folly, altogether decorated, and very proud. And for the food aficionados - we're eating well. Our hotel does great breakfasts and I seem to have found my favourite combination - fruit followed by excellent bircher muesli and then freshly cooked roti with vegetable curry. How's that for east meets west? 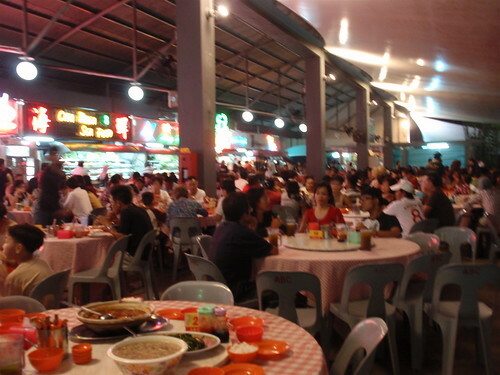 Since we've been in Kuching a number of people had recommended eating at the Top Spot, which is near our hotel. I'm not sure what we'd expected, but certainly not the enormous food court style roof-top restaurant seating hundreds of people. You choose your very fresh seafood from the extraordinary array and it is then cooked for you. We had a flat, John Dory-like white fish steamed with ginger and soy sauce, crisp fried whole prawns in pepper, and quickly stir-fried mixed vegetables including the local edible jungle fern shoots. Lots more to report, but I'm dropping with tiredness - and the heat! Most of the time I'm bright red and a puddle of sweat. Perhaps vainly, I'm hoping I'll acclimatise a bit. Things are a bit chaotic here. As usual, I've left most of my travel preparations till the last minute and even now I'm avoiding them by writing this. But I did get to see nine films at the Sydney Film Festival, and write reviews of them. I have finished off most of the tasks that needed to be done at work before I leave and I've blocked a small shawl and a scarf that have been finished for ages but needed blocking. 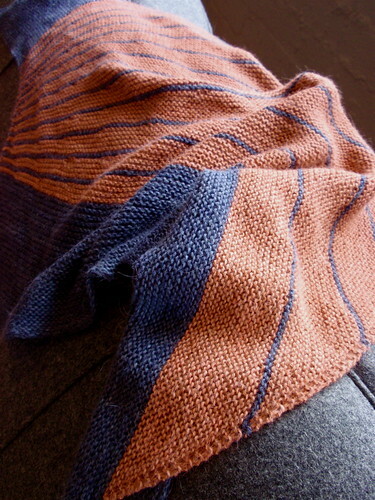 The second of these was Stephen West's Clockwork - a shaped unisex kind of scarf in Stephen West's trademark stripes and combinations of texture. Sorry about the colour variations in the photographs. The gloomy weather we've been having lately has made project photography extremely difficult. 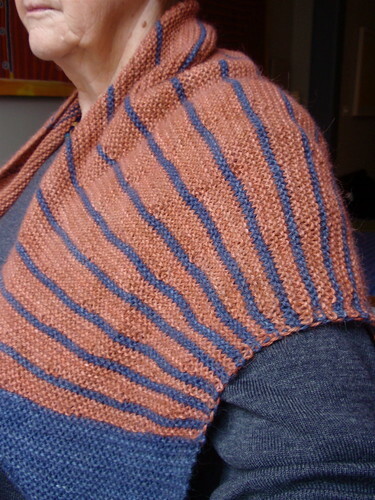 I've used a combination of Jawoll Magic which has subtle, long colour changes in the yarn and Biggan 4 ply for the scarf. The colour combination has worked very well - though I am hoping it isn't too reminiscent of the dreaded green and gold combination that most Australian sporting teams wear! This is a gift for a friend. I posted it today and have my fingers crossed he likes it. But... I didn't manage to finish the grey cardigan I'm knitting for my daughter and had a total disaster with the baby jacket I seem to have been working on for ages. I actually knitted all the way around the jacket (it's knitted around in one piece) to the final front band, only to discover one side of the jacket was at least 2 centimeters shorter than the other - a significant difference in a small jacket. So, I've had to pull undone at least a third of the jacket. 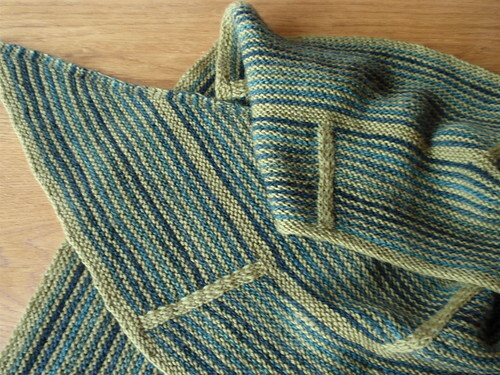 I'm still deciding whether to take this with me as my travel knitting. At the moment I feel rather dispirited about it. So, unless I have a very unexpected burst of knitting productivity, Shades of Grey will become become a travel blog for the next few weeks - internet connections permitting. I attended my final film for the festival last night. Of course, the festival goes on for another five days or so, but I've just run out of film-viewing time. I've work to do and a suitcase to pack to leave for my holiday on Friday. The final film, 'Even the Rain' was engrossing. It uses the conceit of a film within a film - an idea that is sometimes just too clever by half, but that worked very well in this case. A film director (acted by the charismatic Gael Garcia Bernal) and his miracle-working producer are in Bolivia to make a long-planned film of the 1512 rebellion, led by a local chieftain and supported by two priests, against their oppressive colonisation by Christopher Columbus. Unwittingly, and against his initially hard-headed producer's advice, the director casts as the chieftain a local man who is leading an uprising against the privatisation of the town's water supply. The film creates many opportunities to contrast the oppression of the original colonisation with the film-makers' practices of paying low wages and exploiting the labour of the local people. One of the film's strengths is its demonstration that people's moral stances are not always consistent and all-of-a-piece; that even the most apparently righteous person can abandon a moral stance to preserve something precious to them. This is a very generous-spirited and politically aware film that absolutely draws you into its drama. I'd not be surprised if this film is awarded the audience choice award for the festival. A 4 out of 5. Miss Fee sent me today a link to a most entertaining article by eccentric, rude and irrascible Sydney journalist Bob Ellis, arguing that all politicians should be compelled to go to the film festival to learn about other realities and appreciate different viewpoints. How one wishes this were possible. I had such a good day yesterday at the Film Festival. Most satisfying. I saw a Spanish film called 'Amador', whose director, Fernando Leon de Aranoa, made 'Mondays in the Sun' that screened at the Film Festival in 2002 and confirmed Javier Bardem as one of my favourite actors of all time. Amador is set in a large city among marginalised migrant workers who gather discarded flowers from the markets and spruce them up for reselling. But Marcela and Nelson need money for a new fridge to store the flowers. Marcela, who is pregnant but reluctant to tell her philandering husband, takes a job caring for an old man whose relatives are building a house outside the city. He dies within a week of her employment, but she's already committed the money she will earn caring for him. What to do? This is a very gentle social critique that is none the less effective for its gentleness and moments of quiet black humour. It's much more in the tradition of a British film-maker such as Ken Loach than it is like the exuberant and elaborate work of a film-maker such as Almodovar. Fernando Leon spoke intelligently about his film in the brief Q&A that followed the screening (film-makers aren't always intelligent about their own work). He said he'd been striving for an elegance in his cinematography - but I think that's the kind of elegance that comes from being 'plain' - simple, unadorned, spare. It's easy to tell I loved this film with its completely unanticipated resolution. A 4.5 out of 5. If ever anybody wondered why researchers need transparent, publicly justifiable codes of ethics they should watch the brilliant documentary 'Project Nim'. Nim was a chimpanzee who, in the free-wheeling innovative spirit of the 1970s, became the subject of an experiment to socialise him as a human and teach him to communicate with sign language as part of the then current preoccupation with the nature / nurture debate. The film explores Nim's development and the inevitable (with hindsight) problems of neglecting to recognise the chimpanzee part of Nim. The documentary uses archival footage, current interviews with some of the carers Nim had at various stages (who developed complex relationships with Nim and with one another) and re-enactments in a seamless narrative. Throughout you are left exclaiming 'Oh no!' and 'They just can't do that!' as one disastrous decision after another is taken. Excellent. Definitely 4 out of 5. And finally, an Iranian film, 'A Separation'. This film deservedly won the best film award at the most recent Berlin Film Festival. It's deeply interesting because of its depiction of everyday life in Iran, but more particularly by showing Iran's dispute settling and justice system. A couple acrimoniously decide to separate because she wants to leave Iran and he wishes to stay to care for his father who has Alzheimer's disease. Their daughter is torn between the two. The separation leads to stresses in their daily life and unfortunate and damaging choices are made. The film probes with great subtlety issues of truth, ethical choice, and responsibility, while revealing differences of viewpoint and experience - by class, by gender and by religion. This film investigates universal moral dilemmas while providing insights into a very different world. Again, a 4 out of 5. I haven't only been viewing films. 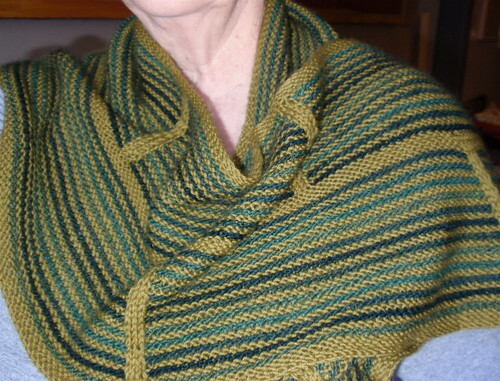 I did manage, finally, to block my Different Lines shawl and wore it to the Knitting Guild meeting last Saturday and afterwards to a Knitting in Public gathering at A Coffee and a Yarn in Newtown. I think this is a brilliant pattern; very simple but most graphic in its asymmetric design. 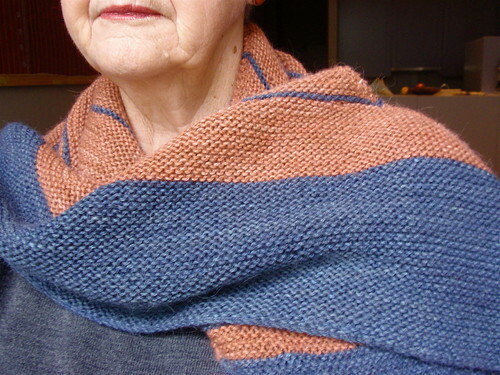 I also like the yarn I used - a cloud-soft alpaca and silk mix from the Scottish yarn company Old Maiden Aunt. And the colour combination worked very well. 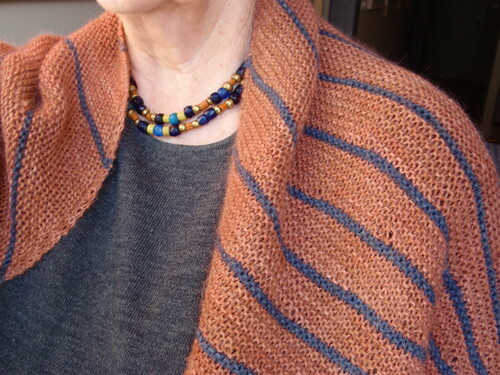 I just wish the shawl were larger, but I had a limited amount of the yarn and just knitted till I had used it all up. It's really more of a scarf than a shawl. 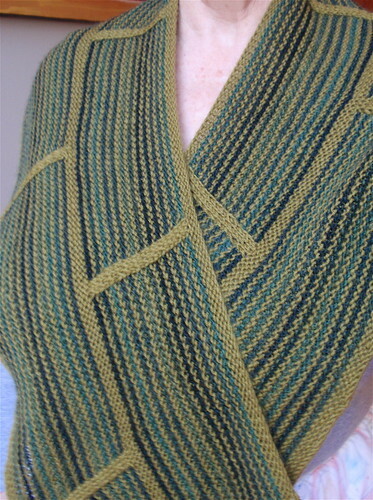 I'd like to try this pattern again with more yardage, but given the plethora of unfinished projects I have, and all the other mentally queued patterns I plan to knit I don't think this will happen for some time. Sydney is meant to be a sunshiny city. Rainy, windy days somehow don't suit it. In an abstract kind of way I feel sorry for people who planned to spend this long weekend doing outdoor things, but much more selfishly I just feel this is perfect weather for film-going. 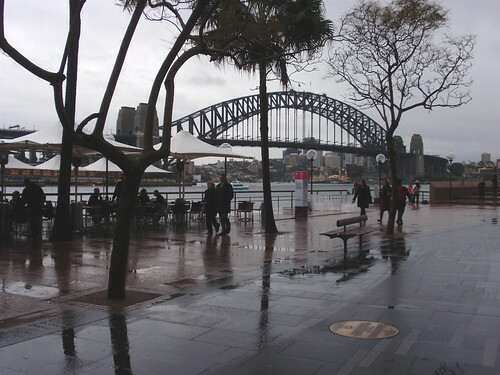 Even Sydney Harbour and the Bridge seemed less attractive today as I queued at the nearby cinema to see 'The Good Life'. This is a Danish documentary that has the characteristics I like in a documentary; the film-maker has chosen an engaging subject and interesting characters and has then let them tell the story in a straight-forward way (with the possible exception of a few too many scenes of portentous waves crashing on rocks). The central characters are an aging mother and her fifties-ish daughter who, though Danish, live in a cramped flat in Portugal. They used to be rich, but now live on the mother's small pension. The daughter blames her mother for her current predicament - accusing her of bringing her up to be rich and then not providing the income to live the life she desires. The mother is torn between guilt at her daughter's upbringing, a sad but realistic acceptance of her daughter's narcissism, and distress at her daughter's future without her small pension. The depiction was both moving and funny - and definitely worth a 4 out of 5. I also saw 'Target', a very long Russian film that screened, rather appropriately, in the grandeur of the State Theatre, freed from the noise of building for the weekend. I dithered about going to see this film, but remembered that last year one of the films I'd like best was a long Russian film, 'How I Ended This Summer', and so decided I would try this one. However, this turned out to be a very different kind of movie - momentous in its scale and themes, with lavish cinematography and a wardrobe to die for. What would you do if you had the opportunity to grow no older than you currently are? How would you live the rest of your life? This is the situation the five central characters of this film enter into rather cavalierly - and then discover its impact. There are also themes of the power of money and possession, petty corruption, lust, and the mindlessness of 'reality' television. But the film is just too much; altogether too excessive for my liking. A 3 out of 5.